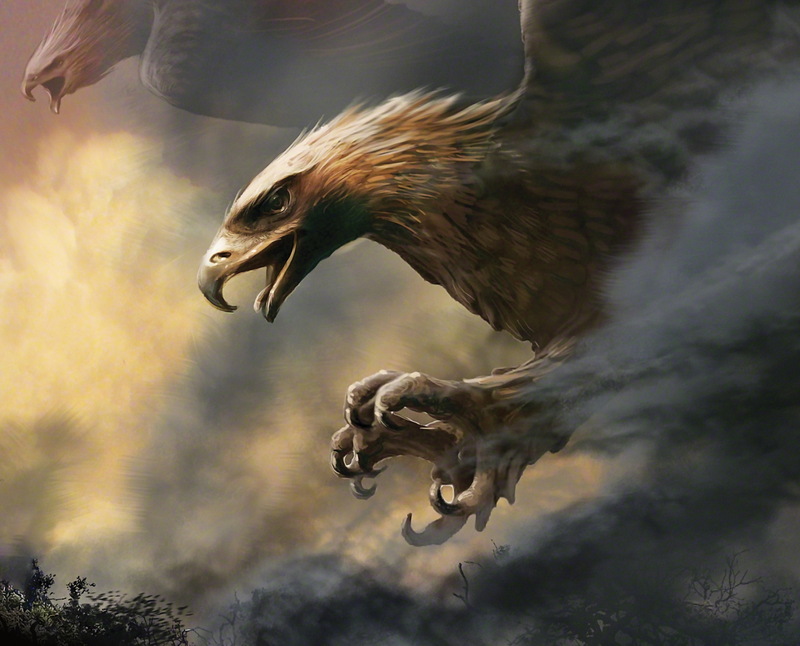 Jan-u-wine has been inspired to write a new piece to commemorate this March 25, a poem written from the point of view of the Great Eagles as they come to rescue Frodo and Sam, lying in the midst of fiery ruin, spent, their deaths imminent. I can’t describe the mood of this piece any more than I can describe the inner life of an eagle, Jan can and does, and it is unforgettable. I am borne up with Meneldor, Gwaihir and Landroval when I read this. The poem has wings, the wings of narrative imagination. The image for this piece was made by Weta concept painter Gus Hunter. Although it was created to illustrate another Tolkien story, The Hobbit, the keenness of the eagle's eye, the readiness of the talons to grasp, the rush of air from below makes it an apt choice for this poem. Always, there is the wind. All the Ages, upon the wind. in the smoke of the day. when she calls forth the crystal rain. It is 25 Rethe in the reckoning of their little land. Of old, we have known this King's grand-sire. His kindly hands receive the care of our charges. Never again will there be need of such dark rescue. which buttress our swift departure. Fare-well to earth and the tethers of two-feet. Fare-well to the Ages which lie behind. WOW!!! This is Jan-u-Wine’s best poem yet!!! Happy Fall of Barad-Dûr everyone!! 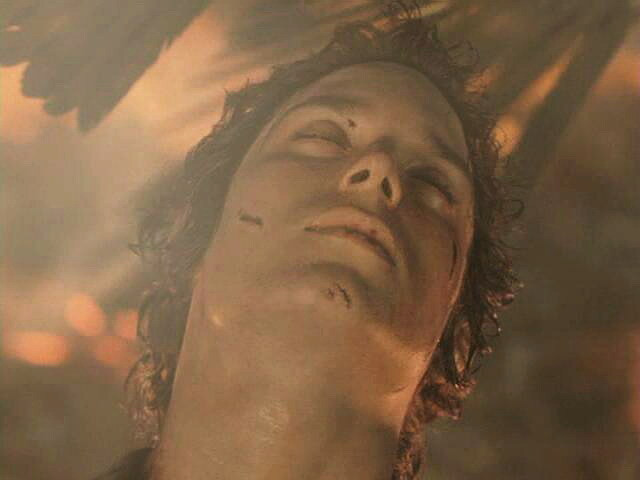 And Frodo... *Swoons! * Wish he could take us all like those eagles!! How dost thou? I haven’t spoken to either you since the last Fall of Barad-Dûr! Re: Happy Gondorian New Year!! (it would be nice indeed, to be borne up by an Eagle). I am *dusting* fine, and how *dustest* thou? RE: Re: Happy Gondorian New Year!! Wait, no, you did see that one because you commented. 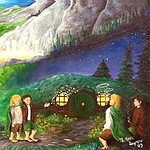 You are a faithful fan of LotR, and an enthusiastic reader. Yay! DUUUURRRR me!! XP I forgot about that one!! Six Years Strong of being a disciple of Middle Earth!! WOOT!! WOOT!! Only getting stronger with every challenge I face! and that is a very, very good *running* indeed! thank you so much again! Just when I think Tolkien and his creation couldn't be more full of meaning, jan and Mechtild come along to make it richer. This "fine down" of lovely visual art, poetry and prose have lifted my spirit. There is so much more to life than we can hold onto at any one time! Thanks so much, BigHeart, for such accolades. You are a perceiving and appreciative reader, full of warmth -- all from your "Big Heart"?